The human microbiota is made up of trillions of cells, including bacteria, viruses, and funguses. The largest populations of microbe reside in our gut: the gut microbiota. The microorganisms living inside the gastrointestinal tract are also known as gut flora. Our bodies are constantly trying to achieve a state of equilibrium in gut flora. There is an immense body of research showing the benefits of balanced gut bacteria in many areas of health. There are many factors in our modern lifestyle that can shift the gut flora balance to bad gut bacteria. These include the consumption of commercially processed foods, antibiotics, stress, and chlorine and fluoride in drinking water. This results in poor gut health, sickness, and obesity. Probiotics have proven health-promoting benefits. One of these benefits is the reduced risk of disease. There are many ways that probiotics reduce the risk of cancer, including aiding with detoxification, improving apoptosis (death of cancer cells), inhibiting tumor growth, and stimulating the immune system. Fermented foods are excellent sources of these healthy probiotics. 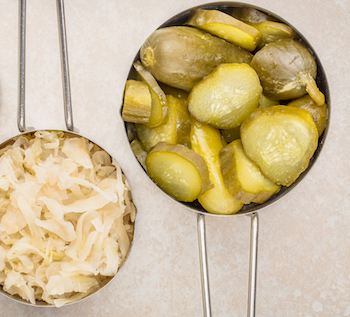 Fermented foods are filled with concentrated nutrients, probiotics, and good bacteria. 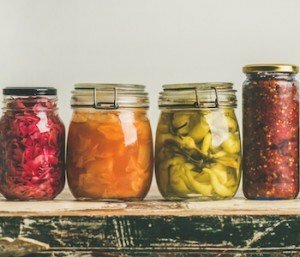 This article will explain what fermented foods are, sources of fermented foods, and 5 ways that fermented foods may reduce the risk of disease and cancer. When fermented foods are consumed, the levels of good bacteria in an individual’s digestive tract are boosted, improving the health of the body’s microbiome (bacterial community). Along with producing various strains of probiotics, this process also preserves the food and creates beneficial enzymes, B vitamins, and omega-3 fatty acids. There are many unique fermented foods all around the world. Our ancient ancestors used fermented foods regularly. Fermentation was necessary to preserve food because there were no refrigerators. Fermented foods were also used by ancient medicine men and physicians to treat ailments. In the early 20th century, Nobel Prize winning scientist Ilya Ilyich Metchnikoff first noted the link between health and longevity and the ingestion of bacteria present in yogurt fermentation. He attributed the remarkable health of a group of Bulgarian people to their daily consumption of probiotic-enriched foods. Metchnikoff theorized that probiotic bacteria could have a greater impact on human health than pathogenic strains of bacteria. Since that time, there have been a vast number of studies on the probiotics contained in fermented foods and their health benefits. Fermented foods have antibacterial, antioxidant, and anticancer properties. Probiotics have a role in the prevention and healing of various health conditions and diseases, including cancer. The most important microbes in our bodies are those in the digestive system. They improve food digestion and absorption, and balance deficiencies in our digestive system. Food digestion depends on the actions of good bacteria, which break down complex sugars, proteins, and fats so the body can absorb them. The probiotics in fermented foods improve the quantity, availability, and digestibility of some dietary nutrients. They are essential in helping us absorb the beneficial antioxidants found in fruits and vegetables. The gut microbiota help with the production of some vitamins, including vitamin B12, Biotin, and vitamin K. Fermentation can magnify protein quality and the bioavailability of B vitamins, magnesium, and zinc. As described above, there are many factors in our modern lifestyle that can shift the microbe balance in our digestive system to bad microbes. Probiotics are able to compete with the bad microbes and colonize our digestive system. The microflora that lives in fermented foods creates a protective lining in the intestines and shields the intestines against pathogenic factors. The ideal balance of good and bad bacteria in the gut forms the foundation for excellent health. Probiotics enhance immunity and increase resistance to infection. It is estimated that 80% of an individual’s immune system is located in the gut. Good bacteria in the gut play a powerful role in supporting the immune system. Fermented foods lead to an increase of antibodies and a stronger immune system. A strong immune system is the body’s top defense system against all disease, including cancer. The immune system plays a pivotal role in disease and cancer prevention. The immune system recognizes and destroys most abnormal cells (some of which can result in cancer). Fermented foods are a cost-effective way to boost the immune system. Metabolic syndrome has been linked to several types of cancer. While it may not necessarily cause cancer, it is linked to poorer cancer outcomes including increased risk of recurrence and overall mortality. Fermented foods are great sources of essential nutrients that help prevent heart disease and metabolic syndrome, including vitamin K2. Several studies have found a positive correlation between increased intake of fermented foods and improved management of metabolic syndrome along with a lowered risk of cardiovascular disease. In one study, it was found that high intake of fermented milk may reduce the risk of cardiovascular disease. Another study associated yogurt with a lower risk of cardiovascular disease. In a 2010 study, fermented whey protein was found to have beneficial effects on lipid metabolism, blood glucose control, and hypertension. These beneficial effects contribute to the management of metabolic syndrome and reduce the risk of cardiovascular disease. Fermented foods have been linked to the death of colon cancer cells (apoptosis). In a study first published in May 2017, fermented soybean extract showed anticancer potential. Researchers fermented soybean seed powder with Lactobacillus plantarum DGK-17, which was previously isolated from kimchi. The fermented extract resulted in morphological changes, reduction of cancer cell colony formation, and apoptotic cell death of colon cancer cells. 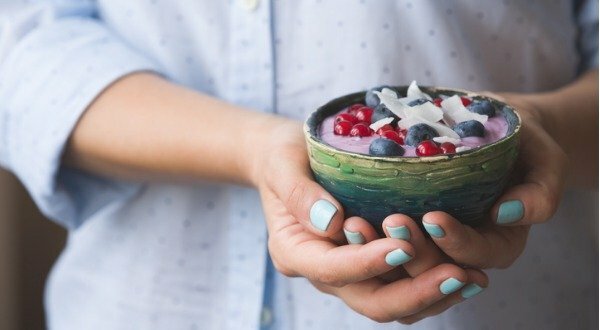 Another study published in 2017 affirmed that fermented foods improve the health and well-being of cancer survivors. In this study, cancer survivors found kefir (a fermented milk product) to be acceptable for consumption. The study stated that kefir has the potential to improve recovery from exercise and the health of cancer survivors. Chronic low-grade inflammation is one of the leading causes of disease, premature aging, and illness. A healthy diet is essential to reducing inflammation. Fermented foods are key to fighting inflammation because they build immunity and help control infections that may underlie inflammation. It has also been found that an intestinal “inflammatory microbiome” exists which may be facilitated by the standard American diet of high-sugar, low nutrient-value foods. Beneficial microbes can offset the consequences of an inflammatory microbiome. Fermented foods are an excellent source of these beneficial microbes. Different cultures around the world have their own unique fermented foods. It is ideal to consume a variety of fermented foods to inoculate the gut with different probiotics. Raw cabbage has probiotics and enzymes that are exponentially multiplied during the fermentation period. Fresh (not canned) sauerkraut is a fantastic source of living enzymes and active lactobacillus and pediococcus strains of probiotics. The most popular of Korean foods, kimchi, is most commonly made by fermenting cabbages. There are many other variations of kimchi using cucumbers, eggplants, leeks, radishes, and other seasonal veggies. Often times these are prepared with a combination of fermented veggies that give them antioxidants, live enzymes, and the special organism lactobacillus, among others. Fermented soy comes in three major forms: natto, tempeh, and miso. Miso and tempeh often incorporate brown rice and barley fermentation with two unique probiotic yeast species. These yeasts enhance the bioavailability of the amino acids and produce high amounts of B vitamins. The bacillus subtilis bacterium is used to produce natto which is rich in proteolytic enzymes and vitamin K2. Natto, which originated in Japan, is made from fermented soybeans. Tempeh, a soy product originally from Indonesia, is frequently used as a meat substitute. Miso, native to China and Japan, is a paste that can be used in soups and dressings. Fermented dairy products (also known as cultured dairy foods) contain diverse microbiota that have a positive impact on health. Dairy products such as yogurt, kefir, lassi, and amasi are fermented with lactic acid-based bacteria. Kefir is a tart, yogurt-like drink that is traditionally make by fermenting dairy milk. Other milk varieties can also be used such as coconut milk and nut milks. Lassi is a yogurt-based drink made salty or sweet. Salted lassi is flavored with spices. Sweet lassi contains sugar or fruits instead of spices. Amasi is fermented milk that is very popular in South Africa. Fermented dairy products share many of the same bacterial strains including lactobacillus and saccharomyces. They also contain one of the most potent probiotic strains, Bacillus coagulans. This combination of probiotic organisms works in synergy to repair and protect the gut, and to destroy even the harshest opportunistic organisms. 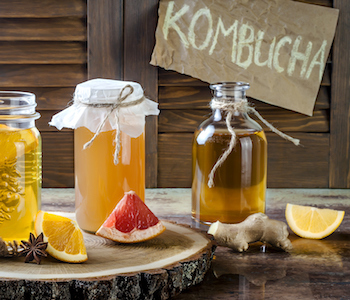 Kombucha is known to support healthy gut bacteria and digestion. There are many other fermented foods and beverages. For example, kombucha is a drink made from sweetened tea fermented with a culture of bacteria and yeast called a “mother.” Some cheeses are fermented as part of their production. There are also fermented breads, such as sourdough bread. As a clinician, I have learned that when individuals react very poorly to fermented foods it is usually a sign of histamine intolerance. Histamine is a compound that is released from immune cells and some gut bacteria. Individuals with histamine intolerance have symptoms such as runny nose, headaches, asthma, and itchy skin. Fermented foods contain high amounts of histamine. Some people cannot handle any high histamine foods while others can handle certain types and not others. As an example, an individual may tolerate avocados, berries, and lemons (which contain some histamine) quite well but have significant reactions with any sort of fermented foods or wine. You as an individual will have to determine whether fermented foods trigger a histamine reaction in you. If so, you may be able to welcome fermented foods back into your life after healing the gut, reducing inflammation, improving liver function, and stabilizing the adrenals. Fermented foods are excellent sources of these healthy probiotics.